Notes: Common in woodland, scrub and damp areas throughout much of the British Isles, especially in the south, but more localised in Scotland and Ireland. Probably under-recorded in Hampshire and the Isle of Wight, where the extent of known records correlate with those areas in which the recording effort is concentrated. Wingspan 7-8.5 mm. 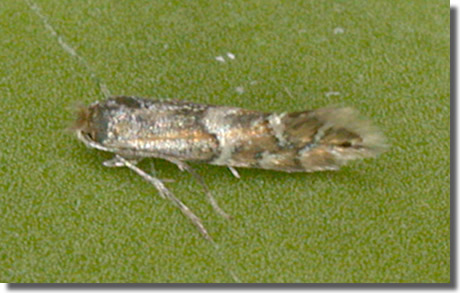 Similar to P. dubitella, in which the first pair of strigulae are elongate, curve strongly towards apex of wing and almost touch to form a sharply acute chevron. 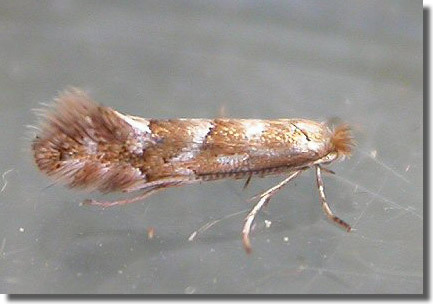 In P. salicicolella the first pair of strigulae almost meet to form a curved band, an obtusely angled chevron or a right angle. The fringe line on the termen is slightly concave in P. dubitella, slightly convex in P. salicicolella. Imago not often seen at light, and more frequently recorded in the larval stage, when mines are relatively easy to find where they are present. Larva mines leaves of Sallow, over-wintering as a pupa in a cocoon.